The Mission is a British film about the experiences of a Jesuit missionary in 18th century South America. The Movie is based on a true story which full of hope, forgiveness and rebirth will. The Film’s prologue depicts the traditional story of the Nativity of Jesus Christ. 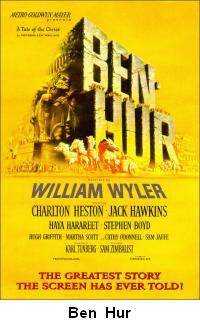 Ben-Hur and Messala (his childhood friend) are happy to reunite after years apart, but politics divide them; Messala believes in the glory of Rome and its imperial power, while Ben-Hur is devoted to his faith and the freedom of the Jewish people.